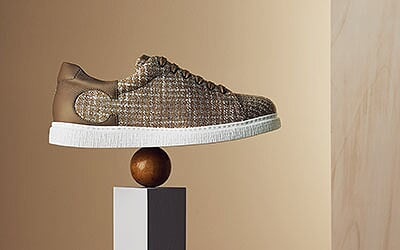 Moving through time – like the hands of a clock – consciously navigating the intersection of past and present, tradition and innovation. 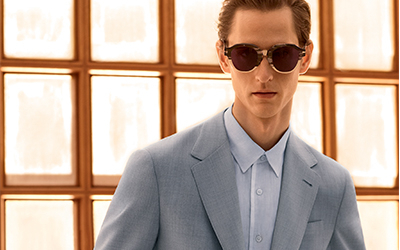 A style that is always an authentic expression of individuality. 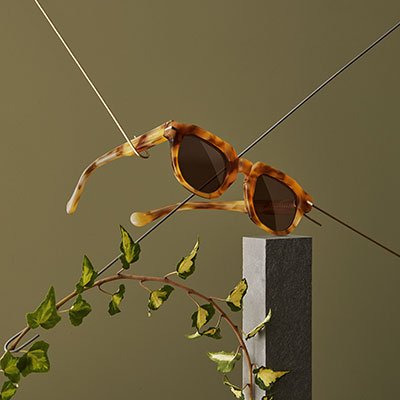 In every moment. Under every circumstance. Unlined single-breasted coat with three buttons in wool-alpaca blend with beige, brick red and black macro houndstooth motif, patch pockets with flaps, and breast pocket with decorative piping; black merino wool crew neck sweater; black cotton T-shirt, charcoal gray flannel pants with front pleat and quarter-top pockets; black calfskin belt with brogue detailing; Bordeaux brush-off calfskin boots. 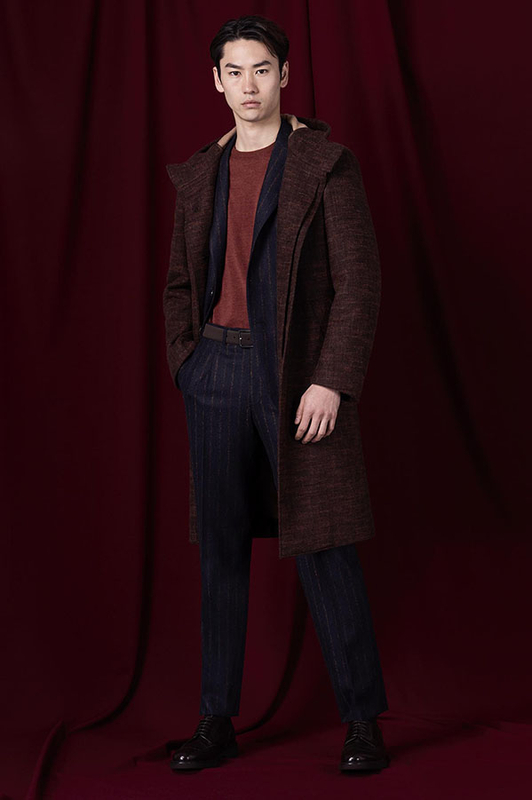 Double-sided, unlined, and single-breasted camel hair coat with brown textured finish, hood, hidden buttoning, and shaped pockets; blue flannel suit with with red brick micro stripes, single-breasted jacket with two buttons, flap pockets, and pants with front pleat and quarter-top pockets; brick red crew-neck sweater in merino wool, dark brown calfskin belt, and dark brown brush-off calfskin derby shoes. 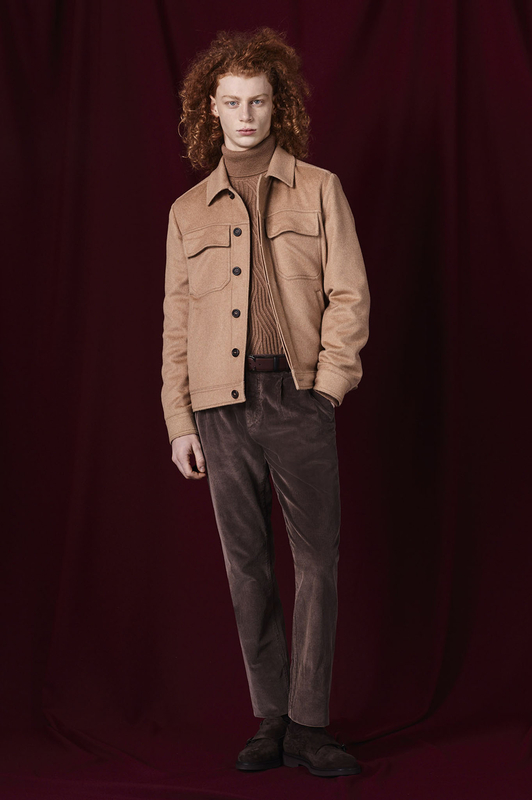 Beige cashmere-silk-vicuña jacket with hidden buttons in real horn, oblique hand pockets, and two front patch pockets; camel extrafine merino wool turtleneck with geometric braiding, hazelnut velvet pleated chino pants; dark brown reversible calfskin belt; dark brown suede double-monkstrap shoes. 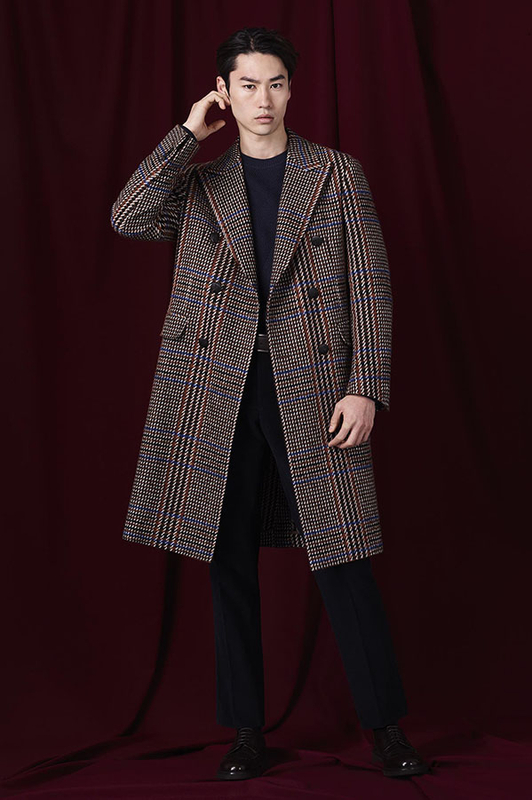 Brown double-breasted wool-alpaca coat in Prince of Wales motif with blue overcheck detailing, 4+2 buttons, flap pockets, back half-belt detail; blue crew neck sweater in merino wool with diagonal stripes; blue velvet pants with front pleat and quarter-top pockets; brown printed calfskin belt; dark brown derby shoes with brogue detailing. 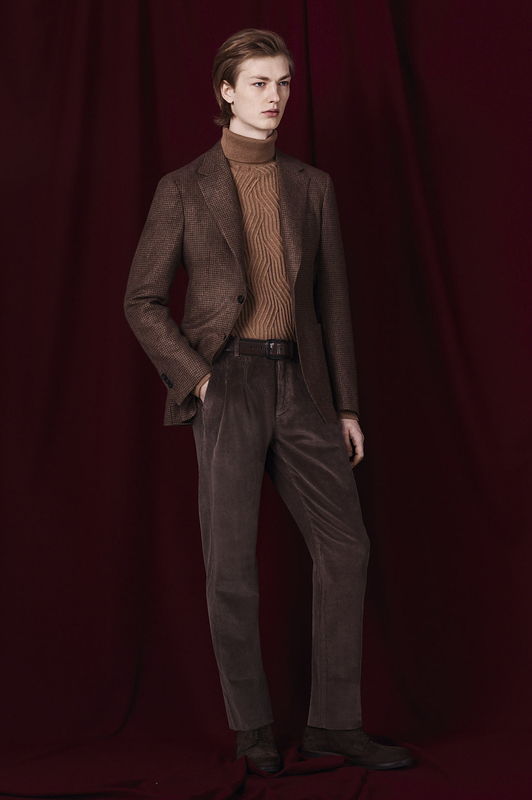 Unlined single-breasted blazer in cashmere with brown houndstooth motif with two buttons and patch pockets; pleated chino pants in hazelnut, beige turtleneck in extrafine braided merino wool; brown calfskin belt; dark brown suede derby shoes. 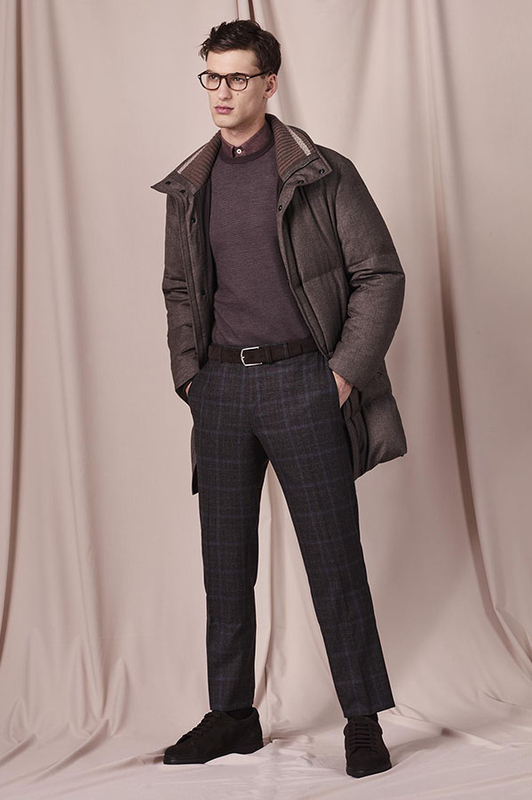 Hazelnut puffy jacket in water repellent cashmere-silk blend with real goose down feathers with horizontal quilt, central zip, and patch double pockets; beige merino wool crew neck sweater with braided pattern; lilac cotton slim fit dress shirt; silk tie with pink and brown houndstooth motif; beige corduroy pants with front pleat; dark brown suede belt; dark brown suede double monkstrap shoes. 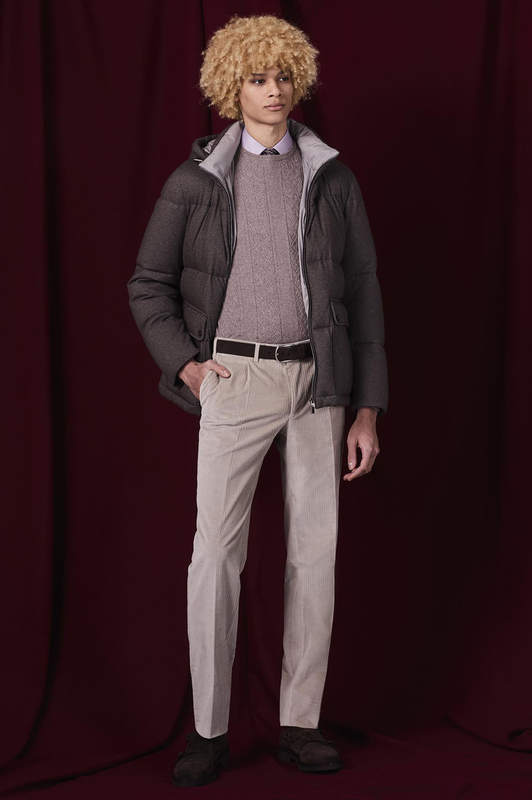 Double-sided, unlined single-breasted parka with hood, buttons, and shaped pockets in textured wool-cashmere-silk blend; casual single-breasted blazer with three buttons rugged edges in textured dark gray wool; dark gray wool-silk crew neck sweater; white cotton crew neck T-shirt; beige corduroy pants with front pleat and quarter-top pockets; dark brown suede belt; dark brown calfskin boots. Heather gray textured wool-cashmere-silk jacket with hidden buttons in real horn, oblique hand pockets, patch front pockets; brown merino wool turtleneck with geometric knitted pattern; heather gray flannel pants with front pleat and quarter-top pockets; reversible brown calfskin belt with Canali C buckle; brown suede sneakers with C detailing and Canali-patterned soles. 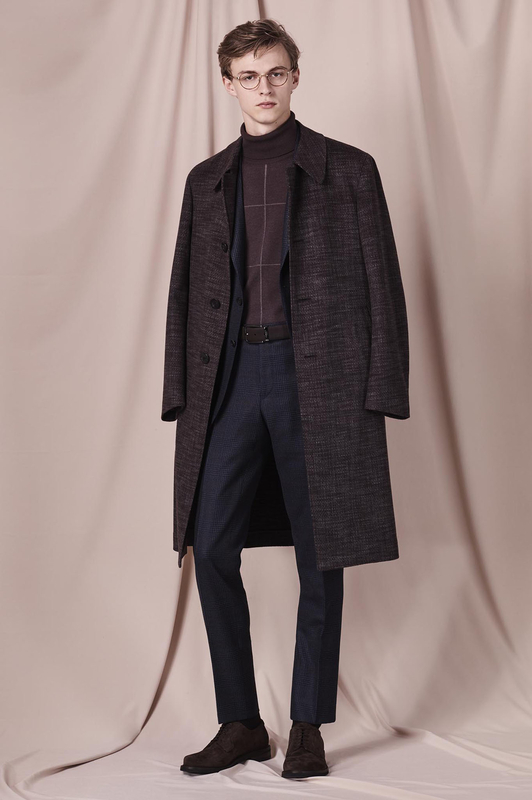 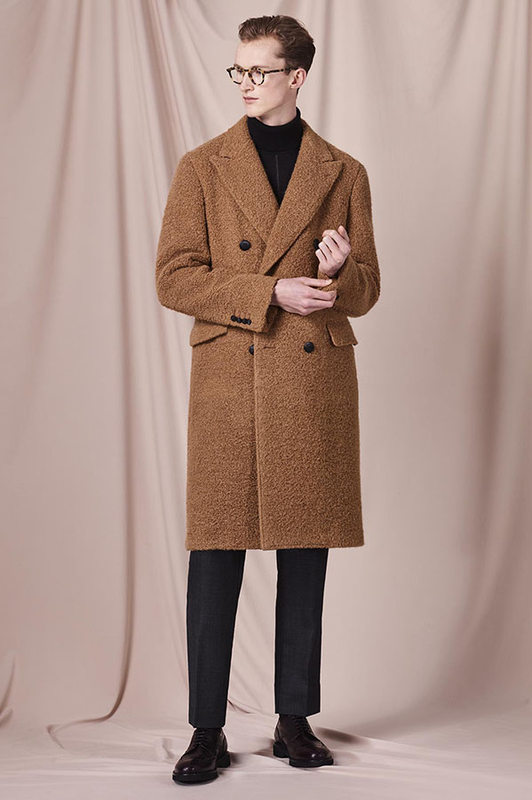 Camel double-breasted coat in textured alpaca-wool blend with flap pockets and back half-belt detail; black windowpane merino wool turtleneck; black gabardine pleated pants; Bordeaux calfskin derby shoes with brogue detailing; round-frame metal optical glasses in semi-matte gold. 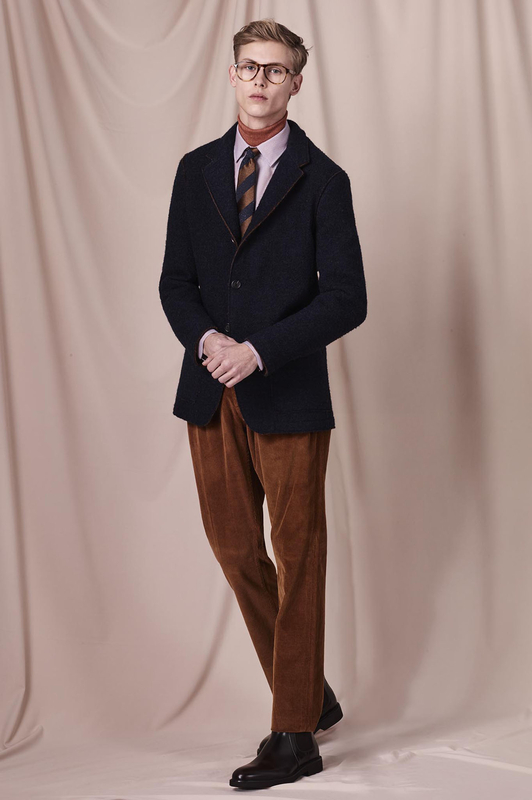 Blue and camel casual double-sided single-breasted blazer with rugged edges and patch pockets in pure wool; slim fit dress shirt with white, blue, and copper micro motif; brick red wool-silk turtleneck; satin tie with blue and brown macro stripes; brown corduroy pleated chino pants; brick red suede belt; dark brown brush-off calfskin boots; keyhole light tortoiseshell acetate optical glasses. 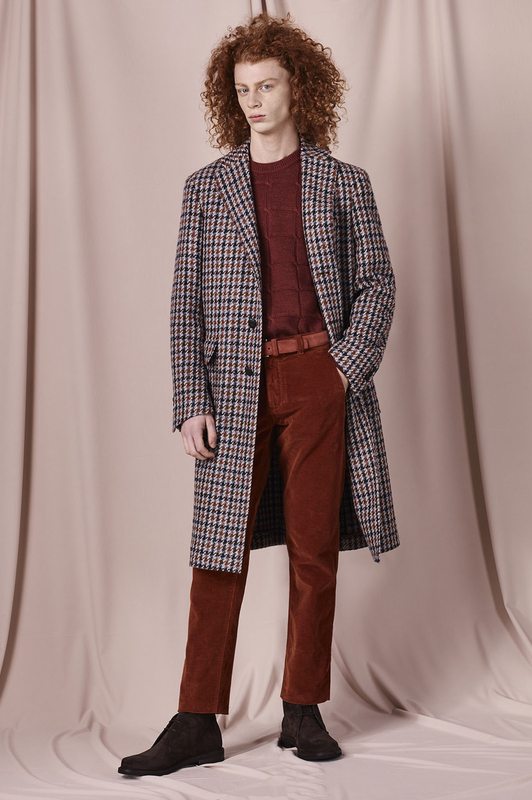 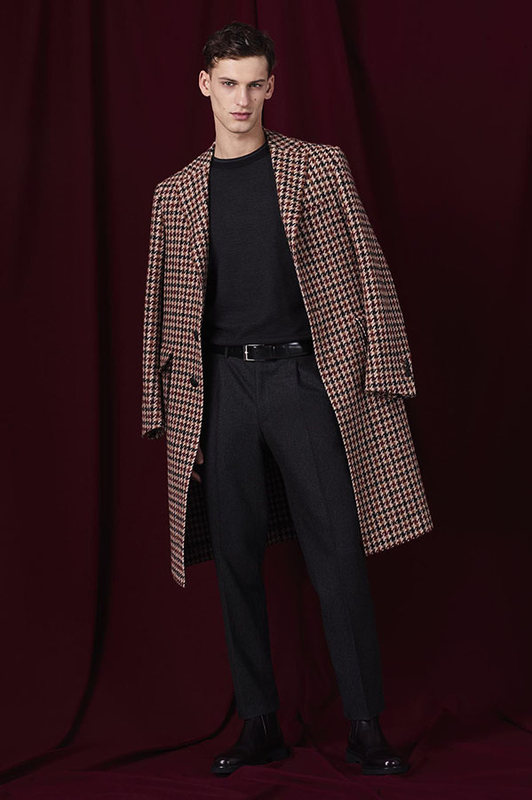 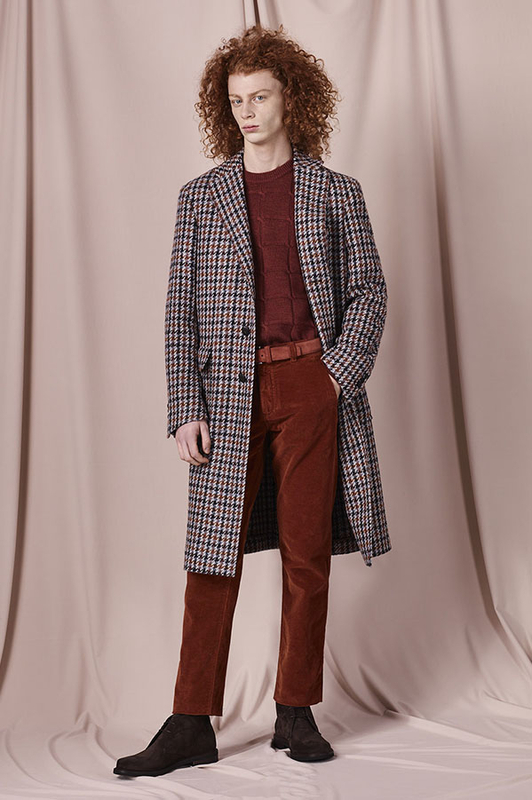 Unlined single-breasted coat with three buttons with breast pocket with piping and patch pockets with flaps in brown and light blue macro-houndstooth motif in an alpaca-wool blend; brick red crew neck sweater in merino wool with macro-check; brick red velvet 5-pocket pants; brick red suede belt, and brown suede ankle boots. Brown textured cashmere single-breasted coat with 3+1 buttons, shirt collar; blue wool suit with brown Prince of Wales motif, single-breasted jacket with two buttons and patch pockets, and flat-front pants with quarter-top pockets; brown windowpane wool turtleneck; brown printed calfskin belt; brown suede derby shoes; and round-frame dark tortoiseshell acetate optical glasses. 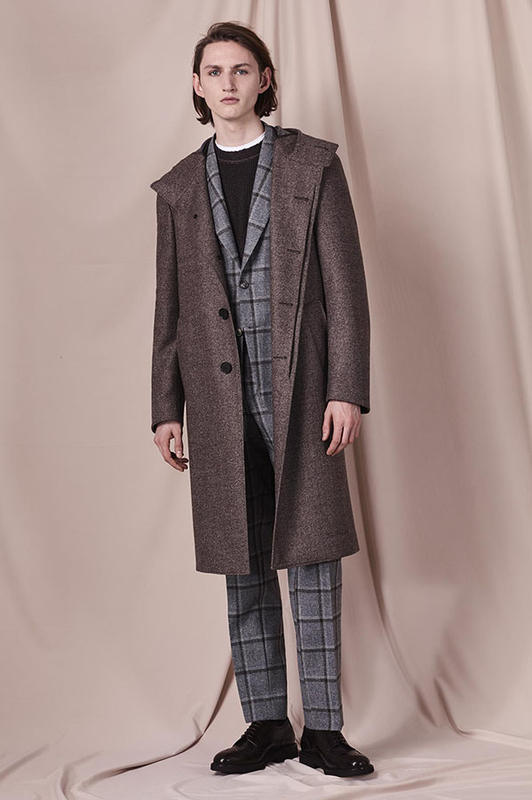 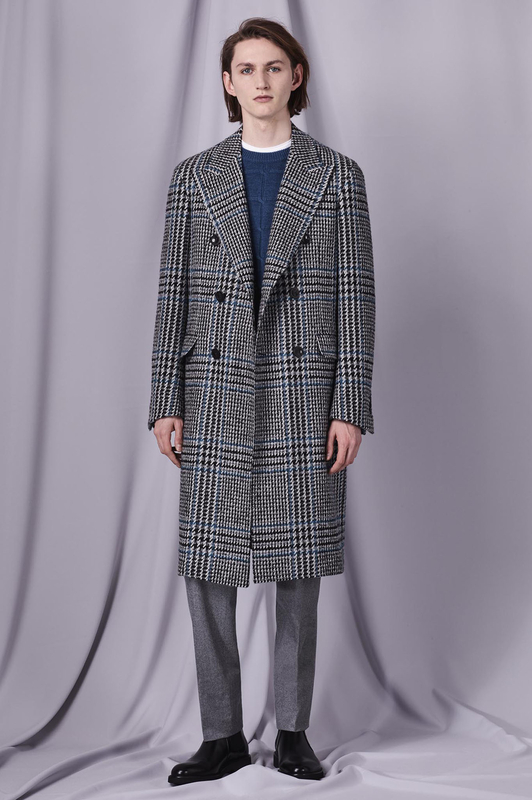 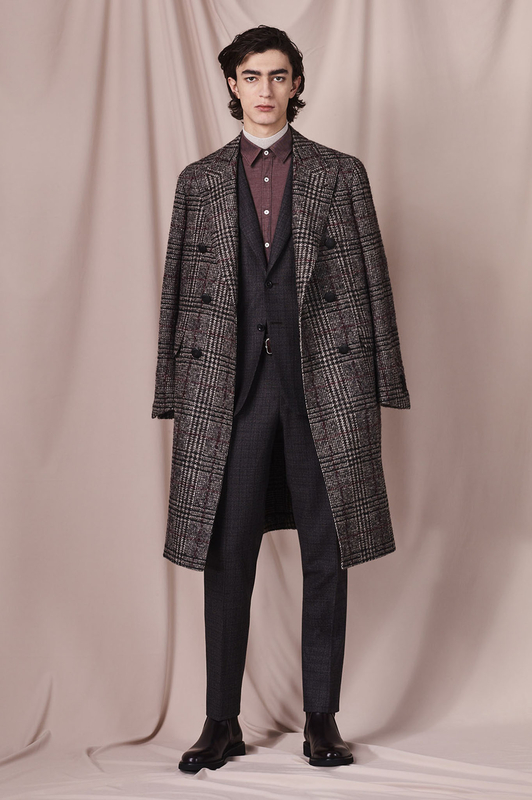 Unlined double-breasted coat with 4+2 buttons in textured wool-alpaca-mohair-silk with dark brown, blue, and gray Prince of Wales motif, flap pockets, and back half-belt detail; brown and blue wool suit in houndstooth motif with unlined single-breasted jacket with two buttons, patch pockets, and flat-front pants with quarter-top pockets; brown slim fit shirt in cotton with gray micro-chevron pattern; beige merino wool turtleneck; Bordeaux printed calfskin belt with herringbone motif; Bordeaux calfskin boots. 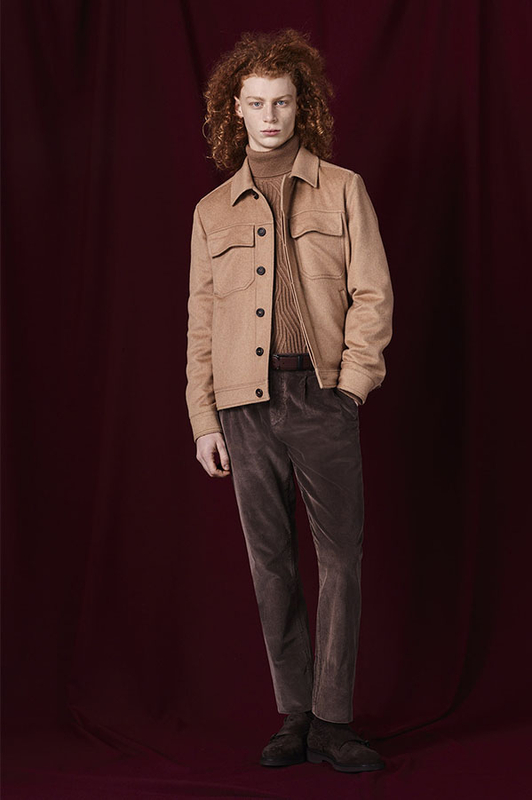 Brown long puffy jacket in 150's wool flannel with real goose down feathers, horizontal quilt, knitted inner collar, and oblique hand pockets with zippers; gray and brick red slim fit shirt; brown crew neck sweater; brown checked pants in Super 170s wool and cashmere blend, dark brown suede belt, dark brown suede sneakers with C detailing on the side and patterned rubber soles; brown rectangle-frame acetate optical glasses. Double-sided, unlined single-breasted parka with hood, buttons, and shaped pocket in brown and gray textured wool; gray wool-silk-linen suit with brown overcheck with an unlined single-breasted jacket with two buttons, patch pockets, and pants with front pleat and quarter-top pockets; brown wool-silk crew neck sweater; white cotton T-shirt; brown printed calfskin belt; dark brown derby shoes with brogue detailing. 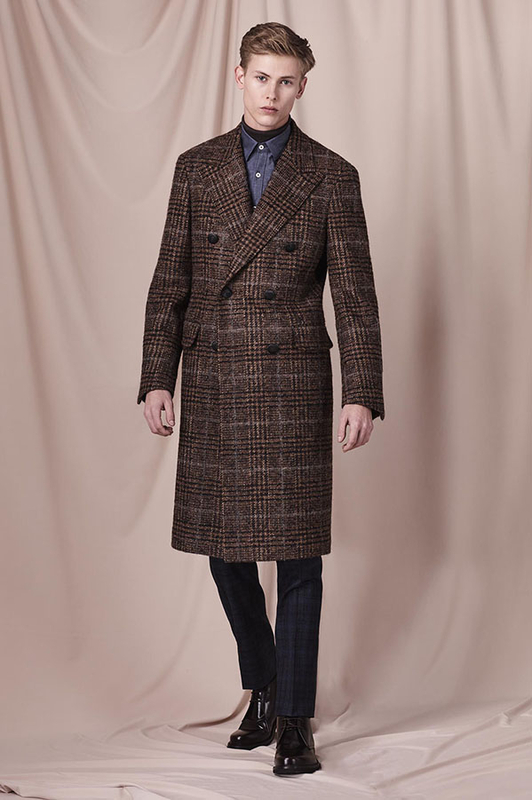 Double-breasted coat in brown wool-alpaca-mohair-silk blend with macro Prince of Wales motif with 4+2 buttons, peak lapels, flap pockets, and back half-belt detailing; blue and brown check motif wool suit with unlined single-breasted blazer with two buttons and flap pockets, and flat-front pants with quarter-top pockets; casual slim-fit shirt in gray and light blue micro-chevron cotton; brown wool-silk turtleneck sweater; tubular braided belt in calfskin and technical fabric blend; and dark brown calfskin ankle boots. 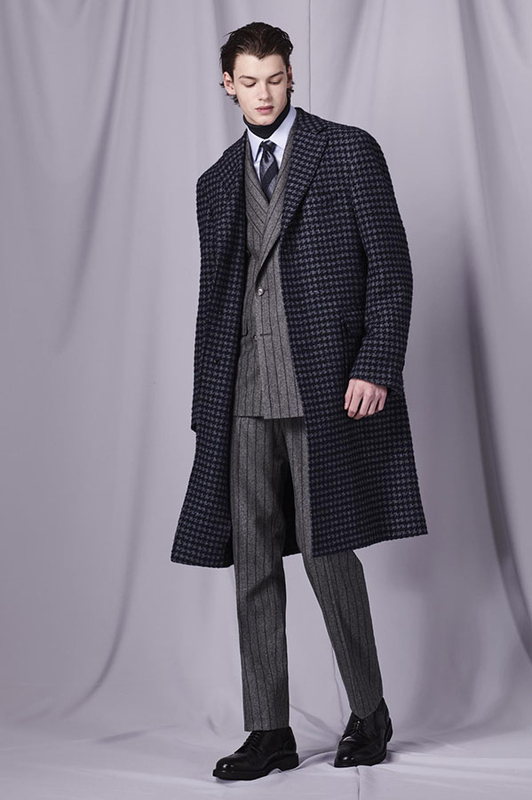 Blue and gray unlined single-breasted coat with 3 buttons in wool-alpaca blend with macro houndstooth pattern, patch pockets with flaps, and breast pocket with piping; gray textured flannel suit with blue micro-stripes including double-breasted jacket with 4+2 buttons, flap pockets, and pants with front pleat and quarter-top pockets; gray wool-silk turtleneck; white and blue Impeccabile slim fit dress shirt with honeycomb pattern; satin tie with blue and gray stripes; black calfskin belt; black calfskin derby shoes with brogue detailing. 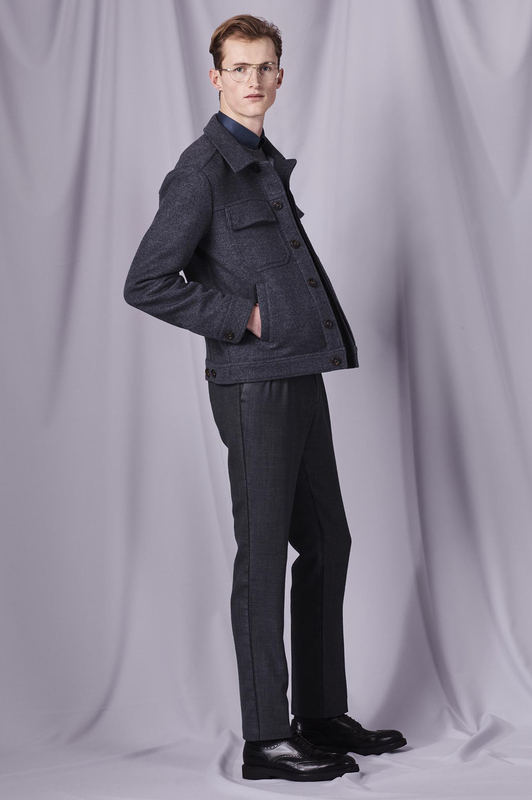 Dusty blue cashmere jacket with shirt collar, real horn hidden buttoning, oblique hand pockets and patch front pockets; gray knitted merino wool crew neck sweater; blue slim fit shirt in jersey with honeycomb pattern; wool gabardine pleated pants in gray; black calfskin derby shoes with brogue detailing; shiny silver aviator-frame metal optical glasses. 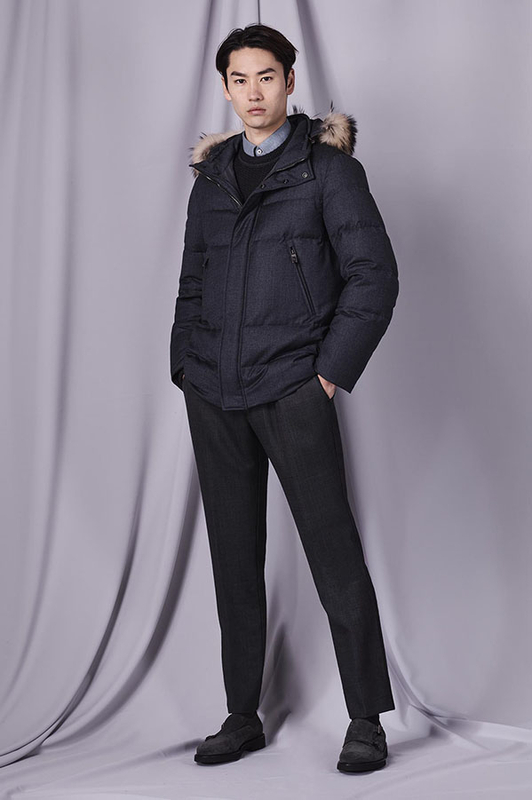 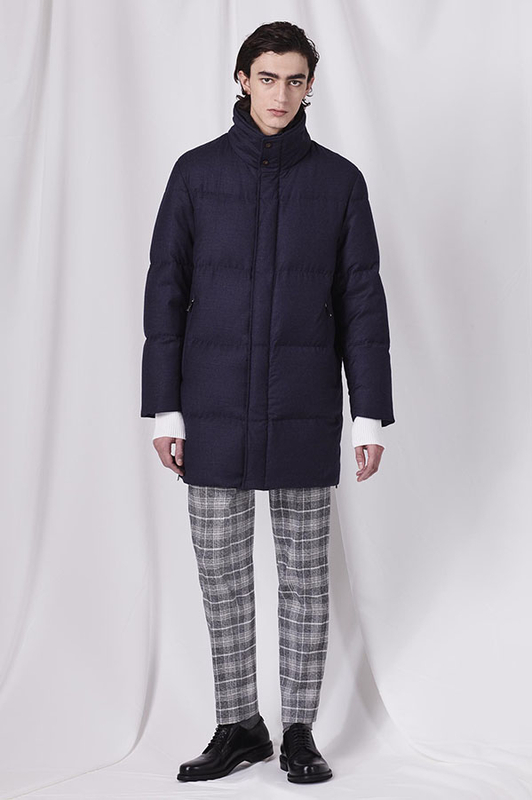 Gray Super 150's wool puffy jacket with real goose down feathers, horizontal quilt, micro-chevron motif; central hidden zipper; oblique hand pockets with zippers, and removable hood; gray wool-silk crew neck sweater; petrol blue slim fit shirt in jersey with honeycomb pattern; gray suede double-monsktrap shoes. 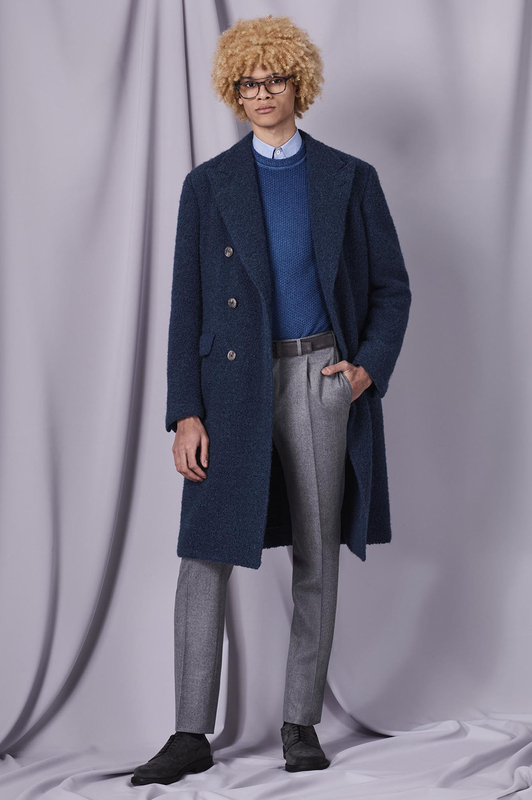 Petrol blue unlined double-breasted coat in micro-striped alpaca-wool blend with 4+2 buttons, flap pockets, and back half-belt detail; sky blue wool-silk crew neck sweater; light gray texture pants with front pleat and quarter-top pockets; gray suede belt; gray suede derby shoes; rectangle-frame acetate optical glasses with gray strip. 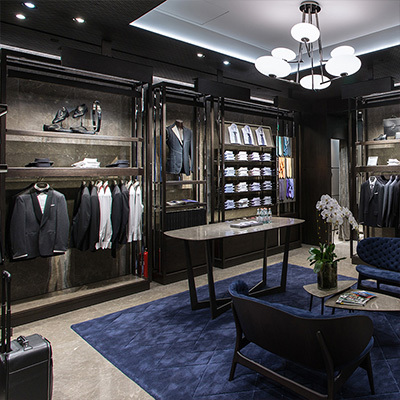 Dark gray wool suit with macro Prince of Wales motif with petrol blue detailing, single-breasted jacket with three buttons, flap pockets, and flat-front pants with quarter-top pockets; sky blue wool-silk turtleneck; slim fit cotton dress shirt with white and blue micro-motif; black calfskin belt with brogue detailing; and black calfskin boots. 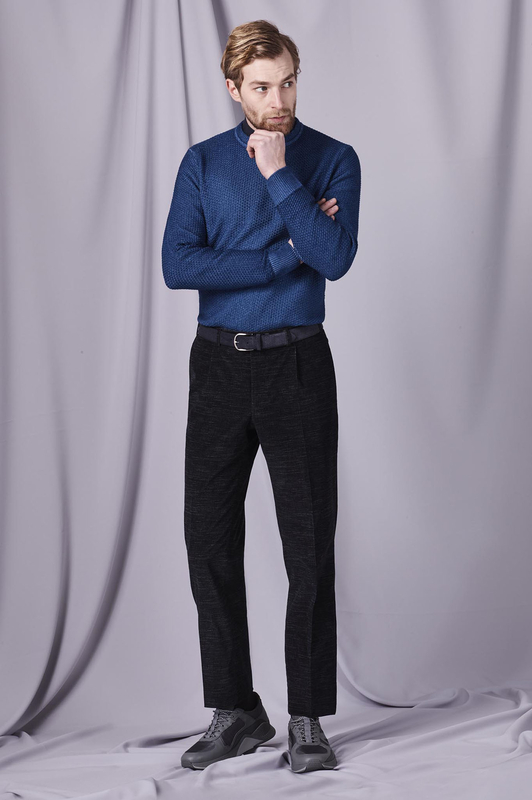 Sky blue crew neck sweater; dark blue slim fit shirt with micro herringbone motif; velvet pants with front pleat and quarter-top pockets; gray suede belt with squared pattern; gray chunky sneaker in calfskin-technical fabric blend. Black and gray unlined double-breasted coat in wool-alpaca blend with Prince of Wales pattern, petrol blue detailing, flap pockets, and back half-belt detail; merino wool crew neck sweater with sky blue squared motif; white cotton T-shirt; light gray textured flannel pants with front pleat and quarter-top pockets; dark brown calfskin belt; black calfskin boots. 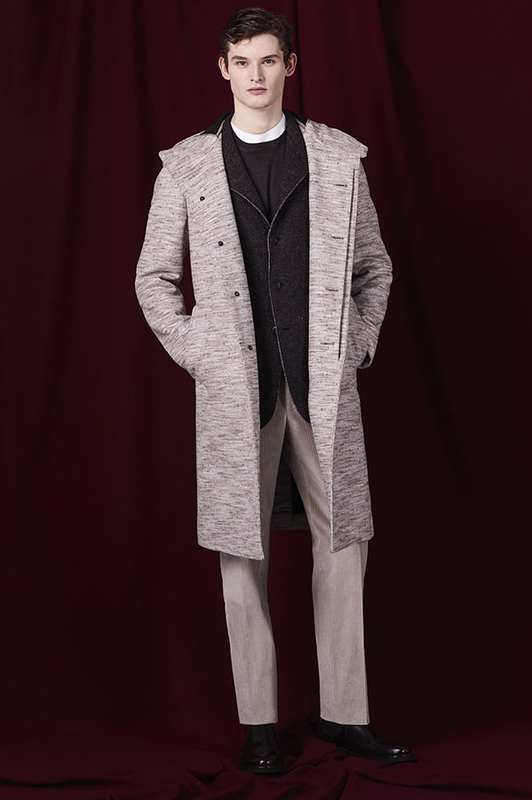 Dark purple Super 150's wool-silk car coat with micro-chevron motif, real goose down feathers, horizontal quilt, stand-up collar, central hidden zipper, and oblique hand pockets with zippers; white merino wool crew neck sweater with squared pattern; gray cotton pants with front pleat, elastic drawstring, in white and gray checked pattern; black calfskin derby shoes. 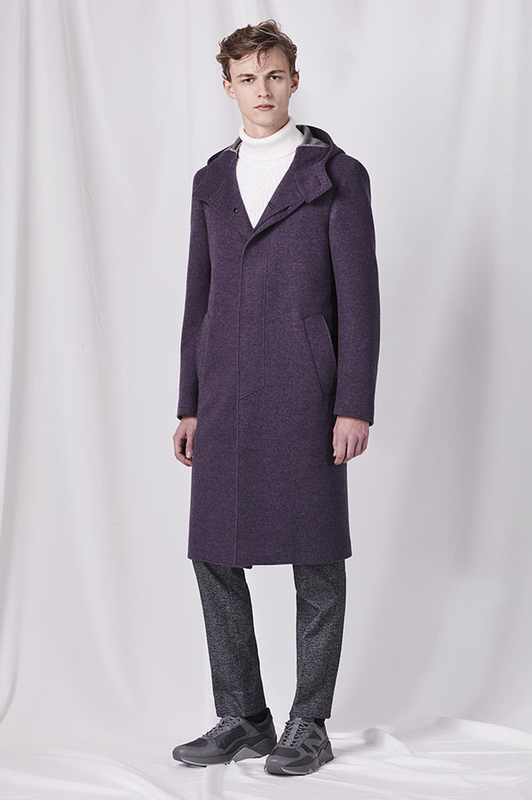 Unlined single-breasted coat in dusty purple cashmere with purple hood, hidden buttoning, and shaped pockets; white merino wool turtleneck; gray pant with front pleat and elastic drawstring; gray calfskin chunky sneakers. 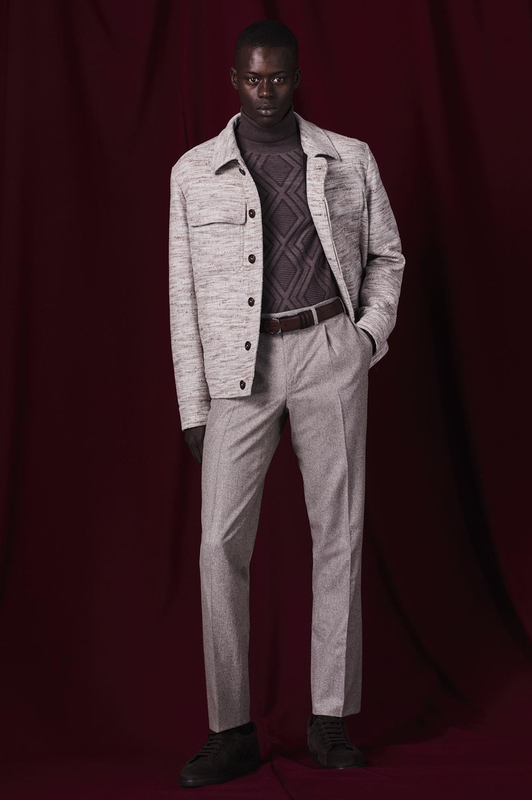 Purple cashmere jacket with hidden real horn buttons, oblique hand pockets, and patch front pockets; white merino wool turtleneck; gray pants with front pleat and elastic drawstring; gray calfskin chunky sneakers; semi-matte gunmetal aviator-frame metal optical glasses. 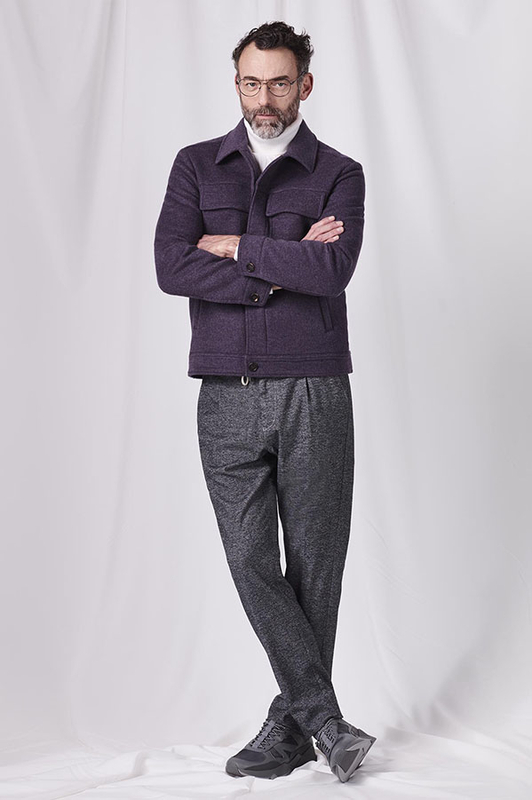 Purple water repellent silk-cashmere bomber jacket with real goose down feathers, hood, central zipper, lateral pockets, and knitted detailing; white merino wool crew neck sweater with squared pattern; pant with front pleat in white and gray checked pattern with elastic drawstring; black calfskin derby shoes. 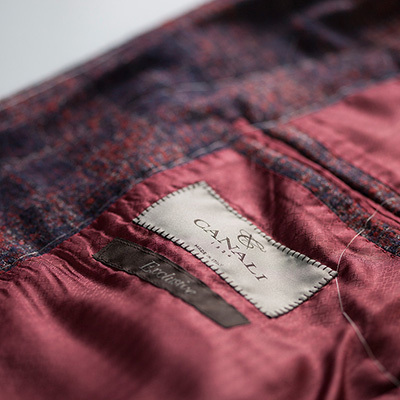 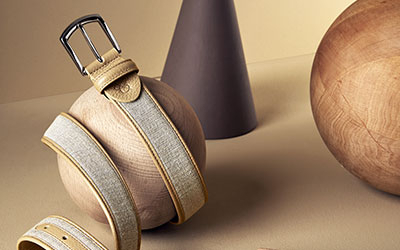 Leisure and luxury collide in a our new capsule collection. 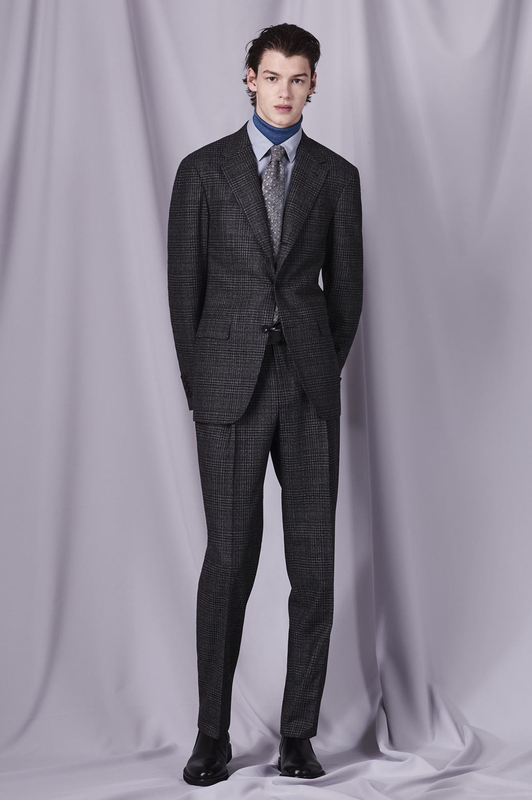 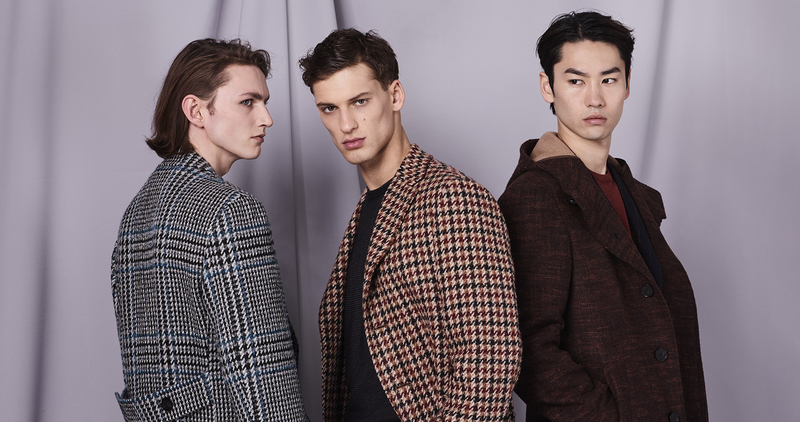 Shades of gray and black encapsulate the garments while a graphic play on the Canali name undulates throughout as a distinguished motif, signaling a style designed to flow along with the current of time. 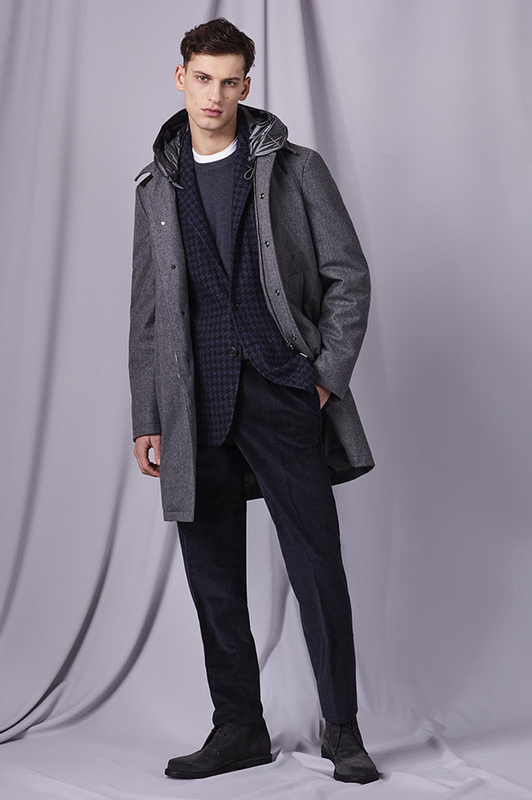 Black jersey single-breasted blazer with two buttons and patch pockets; black zip-up hoodie in jersey with raglan sleeves; cotton T-shirt with allover graphic play on the Canali name; jersey pants with front pleat and elastic drawstring wait; black and gray chunky sneakers. 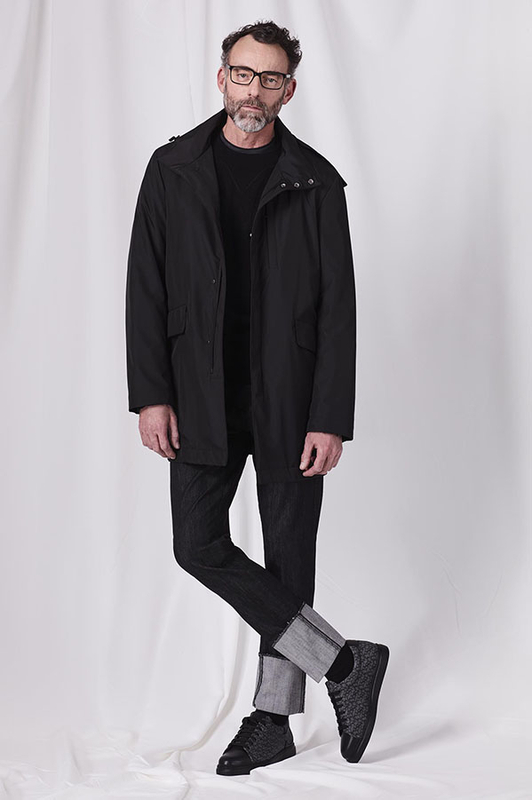 Black leaftec water and wind resistant jacket with stand-up collar, central hidden zipper and snap buttons, detachable hood, hand pockets with flaps, detachable inner layer with graphic play on the Canali name; black merino wool crew neck sweater with all-over graphic play on the Canali name; black cotton T-shirt; black 5-pockets pants; black and gray sneakers in cotton and technical fabric with screen-printed Canali text, rectangle-frame acetate optical glasses in hunter green horn. Black leaftec water and wind resistant jacket with stand-up collar, central hidden zipper, detachable hood, oblique hand pockets with zipper, detachable inner layer with graphic play on the Canali name; Black cotton sweatshirt with laser-cut Canali text in suede thermally pressed on the front, black cotton T-shirt; gray and black calfskin chunky sneakers; dark gray and black rectangular bag with adjustable shoulder strap in leather and technical fabric with allover screen-printed Canali text, and zipper. 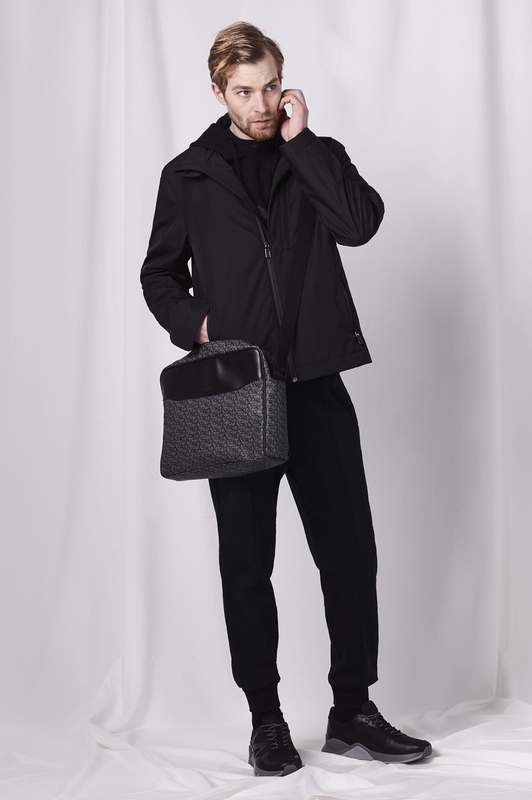 Black cotton sweatshirt with laser-cut Canali text in suede thermally seamed on the front; black stretch denim pants; leather and technical fabric backpack with all-over Canali screen print, zipper, adjustable shoulder strap, and front pocket with zipper; black calfskin chunky sneakers.